Below are some of our horses that have been recently adopted and loving their new homes! Have you adopted one of our horses recently? We would love to hear how the two of you are doing! Email﻿ r﻿﻿aradoption@gmail.com﻿ to tell us your story and send us photos of you and your new family member! 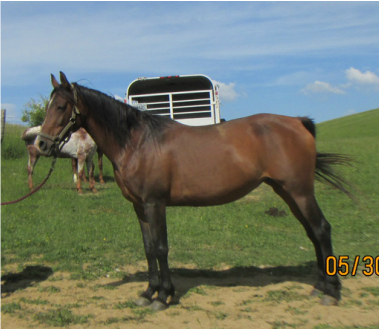 Izzy is a Black Bay Standardbred Cross mare will be able to do almost any job asked of her with a little more work! She spent the summer teaching kids how to walk/trot/canter, tack and handle a horse. She has a level head and a loving personality. Izzy is very willing to learn and loves to work. Her trot can be a bit fast passed at times because she is not sure if she wants to trot or pace, but when a rider with a good seat and quiet hands is on her she will smooth out. Izzy still needs some more miles out on the trail and is eager for riders to teach her. Her ground manners are amazing, and she gets along with every horse in the field. Description: Fancy is a Quarter Horse mare that is a beautiful Grulla color. She is great on trails and in the arena, but can be forward. She has a good walk/trot/canter, with good field manners, but we are working to improve her ground manners. She has a good temperament, and is very trusting even with limited sight in her right eye due to trauma prior to coming to us. She is a horse that wants to please, and has potential to go in almost any direction her rider wants. She has speed and enjoys playing around as a gaming horse, but you can also slow her down if something like pleasure riding is what you would prefer. We recommend her for an intermediate rider because she still needs improvement on her ground manners, and her sensitivity to leg pressure which cues her to move out. Winter is an off the track Thoroughbred who came to us in 2014 as a surrendered horse for Northern Virginia. She is a sweet mare who is calm in nature and has wonderful field and ground manners. Lisa had been looking for a calm younger Thoroughbred who could help reintroduce her to the show ring in low level dressage and hunt seat. After previously trying a couple of prospects at our rescue, Lisa had almost given up until we remembered Winter! Lisa came out for a second farm visit to try Winter under saddle, and they ended up being a perfect fit! We are so excited that our sweet Winter found a new loving home. We can't wait to hear about their progress in and out of the show ring! Congratulations Winter and Lisa! Jasmine was adopted by Dana in July of 2015. Jasmine came to Winterfrost after being used as a research horse at the vet school for scarring analysis. Jasmine has been a long time favorite of Dana's at Winterfrost ever since Dana began volunteering at the farm and working with Jasmine to help her become a better all around horse. Dana's hard work paid off, and she has even taken Jasmine to the beach for the American Heart Association Beach Ride fundraiser this year. Congratulations to Jasmine and Dana for their new life together, and we wish them all of the best! Force was adopted by Dawn in September 2015 to serve as a field companion for another elderly horse. He is loving his new home and the acres of grass that he can now enjoy. He still hates his stall, even when he is being fed breakfast and dinner in it! But Dawn and he are working on his claustrophobia. Force's new name is Caleb, and we think it is fitting for him. Congratulations Caleb on your new home and Dawn on your new companion! Dan was adopted in 2015 from a young lady who was leasing him and fell in love with this handsome gelding. They are a great match and we're sure they will help each other grow in their skills as horse and rider. We wish the best to Dan and his new owner! Blaze was adopted at the end of February to her new family where she is adored, especially by Chrissy! Blaze was adopted out along with one of our other rescue horses, Rowdy. They will become great companions for each other and their new owners. We know that they are going to love their new home. As you can see, Blaze is already being doted upon! Congratulations to the King Family! Rowdy was adopted at the end of February to his new family where he will be loved on by three sisters! Rowdy was adopted out along with one of our other rescue horses, Blaze. They will become great companions for each other and their new owners. From the looks of it, Kaitlyn and Rowdy already share a special connection! Congratulations to the King Family! Blake found his new home at the end of 2014. His new owner fell in love with him the minute she took him out for a test ride. She is now riding Blake on the trails of North Carolina, and loving every minute of it. Congratulations to Blake and his new family! RB was adopted by one of our dearest friends, Emily! She has had her heart and eye set on this handsome boy ever since she met him. At the end of 2014, Emily made the decision to adopt him and officially welcomed him into her family. Congratulations Emily and RB! 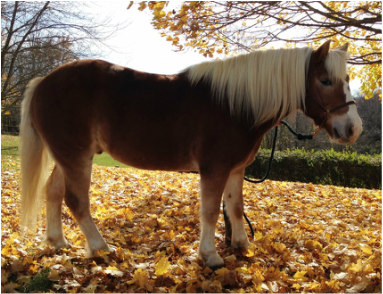 Jewel came to us in the fall of 2012 from and owner whom could not longer take care of their horses. Jewel was professionally trained in western pleasure, and at the age of 4 she began to be used as a broodmare. 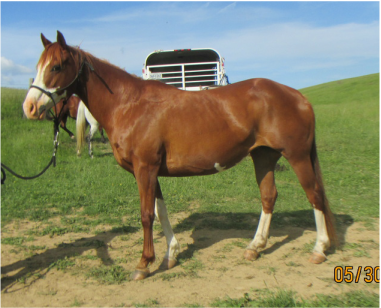 She was used as a broodmare until approximately 2 years before she came to us. After allowing Jewel some time to become accustomed with her new surroundings, we started her until saddle to see what she could do. It didn't take her long for her to remember her training! Jewel found her forever home with Nancy in the Spring of 2014 and has been loving her new home ever since. Congratulations to Jewel and Nancy! Demi came to us because her owner could no longer afford her. She had not been ridden for several years when she came to us, but was trained as a hunter/jumper. She was a bossy mare, but after putting in much time under saddle, she was brought to the point where we felt comfortable putting inexperienced riders on her for trail rides. After being used at boy scout camp for 2 years, one of the camp employees began to lease her and placed her in a hunter/jumper training program, which Demi loved! In the Summer of 2014, the camp employee, Sam, officially welcomed Demi into her family by adopting her. Congratulations to Demi and Sam!